Requiring ballet dancers to have their hair in a bun is so much more than a hairstyle. Every dancer starts the season with the 4 Hs (hair ties, hair pins, hair nets and hair spray). It is their responsibility to keep up with these items and have them in their hair for every ballet class. If the dancer loses these items, she needs to take responsibility and ask her parents for replacements. Ms. Andrea sells kits for $1 or less, so there is no excuse! It isn’t easy to do a ballet bun. And it takes practice. Build your daughter’s confidence by having her do her own bun – it also goes back to the whole responsibility thing. Here’s a tutorial. At age 7, dancers should be able to at least wrap their hair around the pony tail. At age 8, dancers should be able to wrap their hair around the pony tail, secure with pins and put in a hairnet. At age 9, dancers should be able to do the entire bun from ponytail to hair net. Ms. Andrea rewards one dancer in each class for “best bun.” This is done at the end of class, so the dancer has proven the bun is still secure. Again, to win, Ms. Andrea is looking for the 4 H’s. A proper bun secures the hair for all big movements (like jumps and turns). 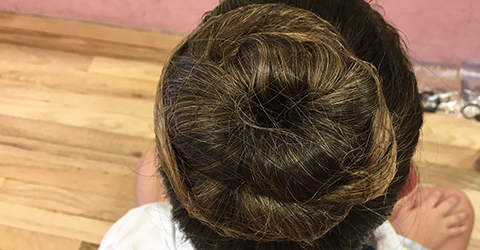 A loose bun can throw a dancer off-balance or worse. The bun also contributes to a dancer’s lines – from the nape of the neck to the hairline.